* Deep well deck means less dripping. 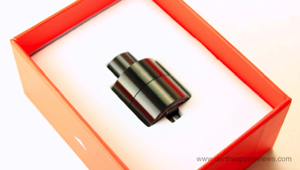 The Digiflavor Lynx RDA comes in a sturdy, cardboard box. The kit includes an Allen Key, a spare parts bag and the Digiflavor Lynx RDA. The Lynx is roughly 1-1/2" in height by 1" in width. It can be disassembled into four main parts for cleaning. 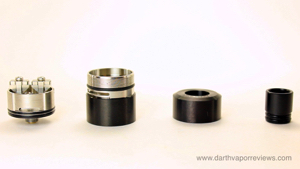 The Lynx RDA is 510 threaded. It features a dual airflow system. The airflow can be adjusted by unscrewing the top piece until the desired flow is reached or close the top cap completely and use the lower deck air holes for a leak-proof flavor mode. 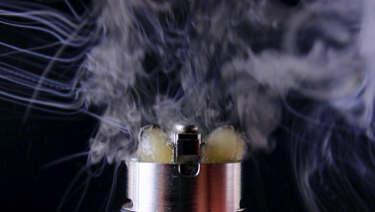 The Lynx RDA is very easy to use. 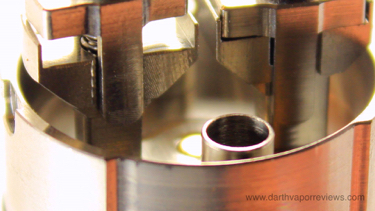 I really like the large, spring-loaded clamps and the deep well deck means less stopping to re-drip. The threads were initially very squeaky, but a little e-liquid fixes the problem. Overall, a great and easy to use RDA. If you would like to pick up the Digiflavor Lynx RDA for yourself, just click on the link or logo below. Have an excellent day and may the Vape be with you! To start a build, pull the outer casing off of the deck body. 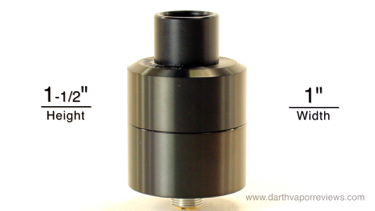 The deck is six millimeters deep and holds two milliliters of e-liquid. The deck also features two spring-loaded clamp style posts. 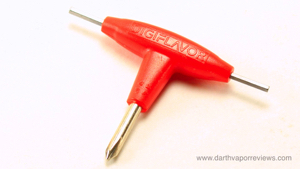 Clamp down your coils to the post using the included Allen key. Pre-fire the coils a few times. Add your wick. Add your favorite e-liquid. Do a test fire mainly because it looks cool. The outer casing has tabs to line up with the deck slots. Push down and click into place.